Alan Irvine’s future as West Bromwich Albion manager looks bleak after his side lost at Stoke City, who registered their second win of the holiday period thanks to two goals by Mame Biram Diouf after the interval. Diouf struck first in the 51st minute and 15 minutes later a lucky deflection off the Senegal forward from Marko Arnautovic’s shot diverted the ball past Ben Foster. It was West Bromwich’s seventh defeat in nine league games although they had put a creditable performance up to the moment they conceded the second goal without being able to convert it into goals, and came agonisingly close to scoring between Diouf’s two efforts when Gareth McAuley hit the post. Albion lie 16th, a point clear of the relegation zone, and at the end of a fairly wretched 2014 the club may well be ready for a change at the helm once again. Things look far rosier for Stoke, who have risen to 10th. 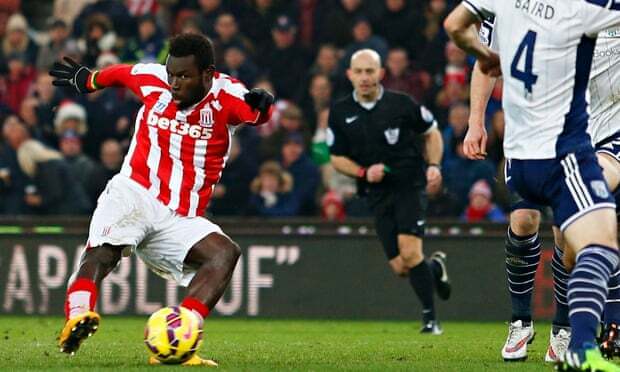 Albion’s record signing Brown Ideye was preferred to Saido Berahino in the starting line-up and was presented with an opportunity in the opening few seconds as he latched on to a ball over the top, but the Nigeria international sent his effort off-target. Asmir Begovic comfortably dealt with a Stéphane Sessègnon attempt before the ball ricocheted to Bojan Krkic on the edge of the Albion box but he lashed a shot just wide. A West Brom break saw another chance come Ideye’s way in the 18th minute but Begovic denied him with his legs and both sides continued to show a lack of cutting edge. James Morrison’s shot was caught by Begovic, Ideye tumbled in the area but play continued and Whelan sent a volley behind off the head of Joleon Lescott. West Brom’s captain,Chris Brunt, sent in a swerving strike in the 36th minute that went close but wide, before Sessègnonn tried his luck with less accuracy. Whelan got a long-range effort on target towards the end of the half that Foster claimed and Stoke were then relieved after losing possession in their own half to see Gardner loop a shot wide. It did not take long for the standard of finishing to improve after the interval as Diouf notched his fifth goal of the season. Bojan lofted the ball out wide, Erik Pieters delivered it into the box and Diouf got away from two defenders before slotting in a shot that took a slight deflection off Lescott. Stoke wasted two decent chances to extend their advantage in quick succession soon after, both coming from Diouf crosses. The first came to Peter Crouch, who was just unable to finish at the near post as a challenge diverted the ball wide, and then Arnautovic was unable to capitalise, nodding wide. 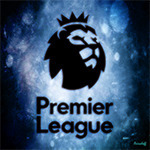 Things were looking ominous for West Brom, but – with Berahino having been sent on for Sessègnon – they then almost snatched an equaliser when Begovic parried a Gardner shot and McAuley prodded against the post. Moments later, Stoke had their second goal in somewhat fortunate circumstances, Bojan passing to Arnautovic and his strike taking a deflection off Diouf that deceived Foster. There were boos from West Brom’s fans at the final whistle and what appeared to be a barrage of abuse from the away section directed at Irvine as he walked past it and down the tunnel. Stoke 4-4-2 Begovic; Cameron, Shawcross, Muniesa, Pieters; Nzonzi, Whelan (Wilson 85),Arnautovic, Bojan (Adam 78), Diouf, Crouch (Walters 63). Subs not used Huth, Butland, Assaidi, Shenton. West Bromwich 4-4-2 Foster; Wisdom, McAuley, Lescott, Baird; Morrison (Varela 63), Dorrans (Mulumbu 80), Gardner, Brunt; Sessegnon (Berahino 63),Ideye. Subs not used Yacob, Myhill, Gamboa, Dawson.